Stephen Wilkinson was born 9 April 1877 and upon the outbreak of the First World War in August 1914, was a 37 year old architect with a wife and two young children, living and working in Calcutta, India. Despite having neither the need nor the requirement to enlist in the forces, he hastened to do so, sailing with his family to England, where he joined the Royal Flying Corps, and was trained as an Equipment Officer. Finding that he lacked the motivation and patience for this role, he was reassigned as a Kite Balloon officer, and following training the the UK was on the point of being deployed overseas with a Kite Balloon Section as an observer, when last minute good fortune dictated that he replace a free ballooning instructor in the UK, mortally injured in a crash. 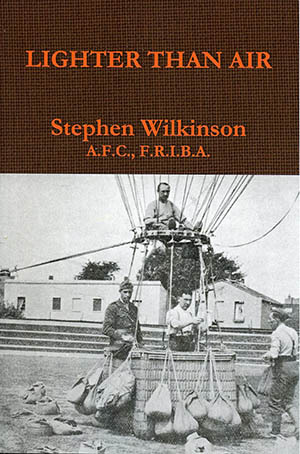 Remaining in the UK for the duration of the war, he served as a free balloon pilot and instructor, making a number of memorable flights and enjoying some interesting experiences, which he relates in this, his autobiography, first published in 1932. He was awarded the Air Force Cross in June 1919, for his valuable wartime service during 1914-18.